Nitrite is toxic and should be undetectable in any well established aquarium. During cycling, it may exceed 20 mg/L. Nitrate is relatively non-toxic, but it is advantageous to control it to under 20 mg/L. 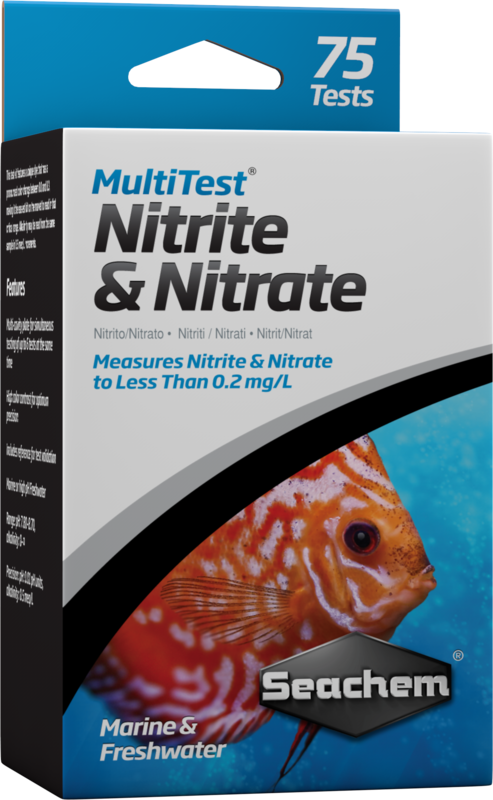 MultiTest™ Nitrite/Nitrate measures nitrite to less than 0.1 mg/L and nitrate to less than 0.2 mg/L in marine or freshwater. The values reported by this kit are expressed as nitrite and nitrate rather than nitrogen (to convert to nitrogen, simply divide by 3.3 and 4.4, respectively). It performs over 75 tests and contains a reference sample for validation. I keep getting high nitrite readings, what could I be doing wrong? A: The test well you are using may be contaminated with Nitrate Reagent#2. Soak the test well sheet in vinegar overnight, then rinse thoroughly with tap water, followed by DI water, and dry completely. The nitrite in the tank is reading approximately 10 ppm. Can I still get an accurate reading of nitrate? A: If you are getting a pronounced nitrite reading, it is not possible to get an accurate nitrate reading, since the nitrite reading will interfere. You should be able to make a very approximate assessment of nitrate, since the nitrate color will be additive to the nitrite color. 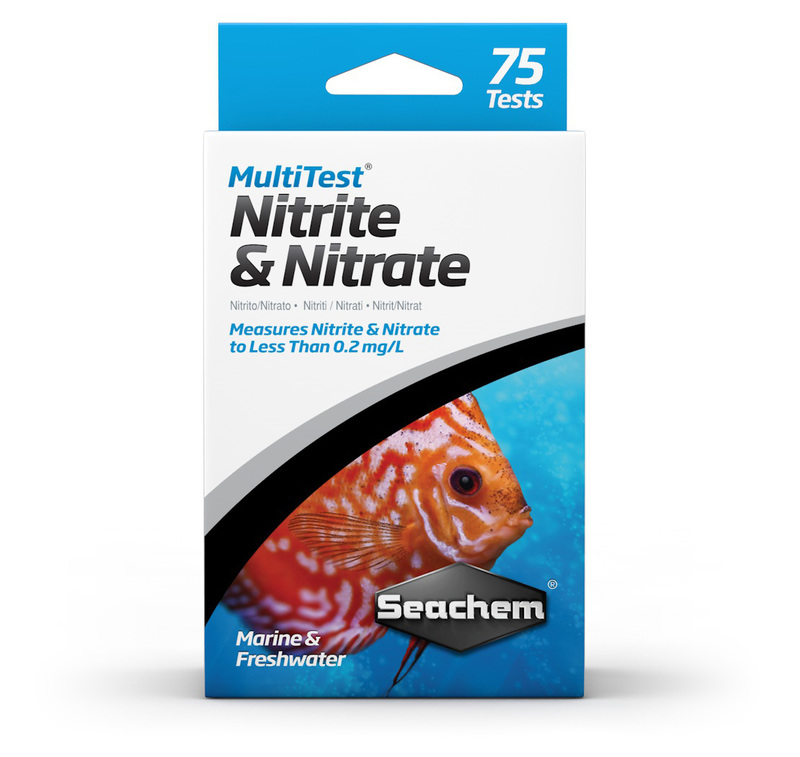 I have dosed my tank with Seachem Prime®, but I’m still getting a high nitrite/nitrate reading with my kit. What is going on? A: Unfortunately, there is not a test kit on the market that can distinguish between the bound form of nitrites/nitrates in the presence of Prime® and the unbound form without Prime®. As long as you have dosed the correct amount of Prime® to your aquarium, you can rest assured that the nitrites and nitrates are safely detoxified. The nitrate reading on my kit is reading too low. I checked the reference and it looks lower than it should be? A: There was an unfortunate typo on several batches of the Nitrate instructions in which the reference was listed as 1 mg/L; it is actually 10 mg/L (which actually makes your problem even more pronounced!). However, if you do the two following two things your test should read the reference correctly (a) use 2 full stems of sample instead of 1 and (b) vigorously shake, squeeze and tap on a table the Nitrate Reagent#2 so that you obtain a very distinctly grey drop. Assuming you get a correct reading with the reference, you can now run your test samples in the same manner and be assured of the test's accuracy. 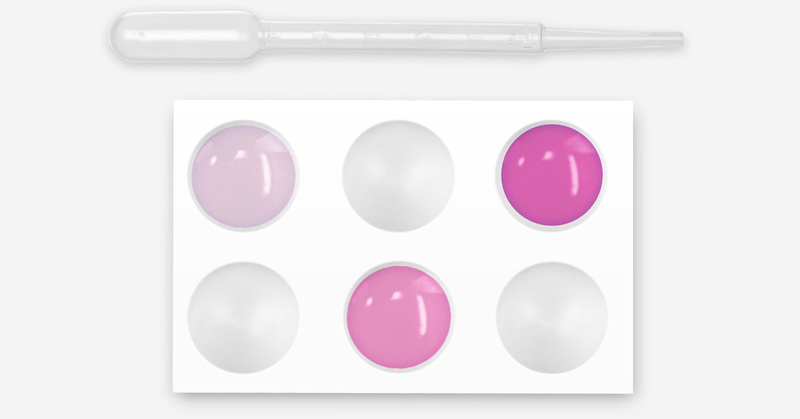 If have followed the above instructions yet you still get too low a reading for the reference, then contact us to obtain replacement reagents. KEEP AWAY FROM CHILDREN! Components of this kit contain acids and organic solvents and may be hazardous if used carelessly. If accidental spillage or contact occurs, wash exposed area thoroughly with water. If eye entry occurs, rinse eyes immediately with water for 10 minutes and then seek medical attention.